Category: Denaturing Gradient Gel Electrophoresis (DGGE). SymphonyDGGE Denaturing Gradient Gel Electrophoresis is a comprehensive system to detect DNA mutations. The system comprises a temperature control unit, stirrer, gradient mixer and casting accessories. 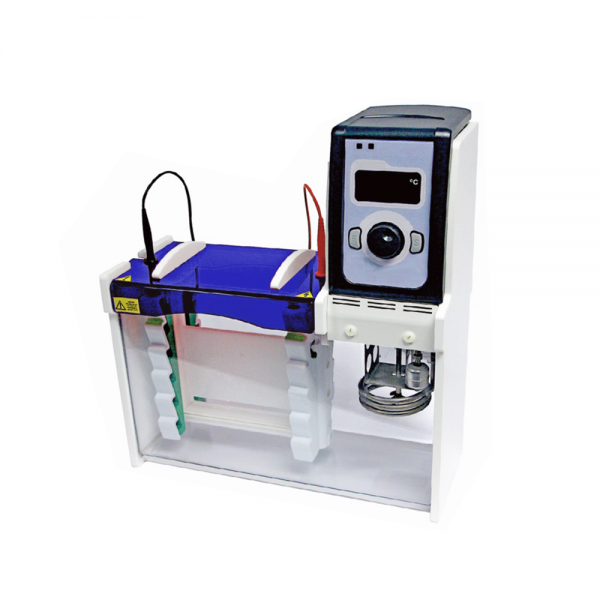 The user-friendly vertical screw-clamp design allows rapid setup of denaturing PAGE gels. Various mutation detection techniques can be carried out with the efficient microprocessor-controlled PID temperature control unit between ambient temperature and 70°C. Among the applications of the system are heteroduplex analysis (HA), parallel denaturing gradient gel electrophoresis (DGGE) and constant denaturing gradient gel electrophoresis (CDGE). The integrated modular design provides great convenience for switching between different mutation detection techniques. The maximum 96-sample throughput enables detection of high mutation numbers within a few hours. The gradient mixer, SDGGE-GM100 is provided as standard for preparation and mixing of high and low density denaturant solutions. With the flat-base design and support handle, SDGGE-GM100 can be secured to a retort stand, providing an easy mount on a magnetic stirring plate. Not only that, the mixing chamber can accommodate a magnetic stirrer to form a linear gradient. An optional peristaltic pump is available for linear and reproducible gradient gels. ii. Increasing denaturant concentrations melt DNA in a domain-specific manner. DNA domain with lowest Tm contains the mutation or polymorphism of interest. iv. The higher GC content in the sample, the harder it melts, thus progressing further into the gel before stopping.